If you are pregnant it is never too early to gather items that will be needed during your hospital visit during delivery. Using a pregnancy hospital bag checklist is highly suggested due to the importance of each and every item that will need to be available during the hospital stay. Those who try to do it by using a mental list normally will forget an important item and it will cause things to be more difficult than need be. Those women who have planned it out using checklists generally have a less stressful trip to the hospital. All they had to do is grab their bag and go. 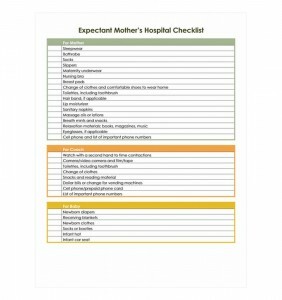 The pregnancy hospital bag checklist template is completely free. The template is also completely customizable to ensure the personal information for each and every individual can be met and logged. It is extremely user friendly and does not take advanced skill in order to customize the pregnancy hospital bag checklist template. Since it can be downloaded right now for free and is very easy to use; each pregnant woman can utilize the organizing aid to help her of the stress that comes with the hectic time when it is “time”. Firstly, when customizing the template it is very important that the doctor information is included on the checklist. Secondly, there should also be an item list and a list of individuals to call during this event. They can be placed in order to ensure the people that need to be contacted are in fact contacted. Thirdly, make a bullet list of items and paperwork that will be needed during your hospital stay to ensure it is included inside the bag, and do not forget to put camera on the list. Firstly, you really need to assess your personal expectations of your stay. Are you having a cesarean or a vaginal birth? Each type of birth will require a certain amount of stay time. This will impact your item list. Secondly, check with your doctor to ensure you have all required documents present when you visit the hospital. The pregnancy hospital bag checklist can be customized to ensure that the list is accurate to help you organize for your visit.